This bundle contains all of the material necessary for teaching 1 semester of Life Skills, Living On Your Own classes in the classroom. For more details click on the individual product or see description below. Life Skills is a two part (2 semester) course lasting a total of 40 weeks. These classes are designed to fulfill general math credit for high school students. The focus is on applying math skills to real world situations, not the mechanics of how to do the math. Get one full year of access to the curriculum online as you teach students specific skills that will help you now and prepare you to live on your own. Topics include managing your time, getting a job, paying bills, budgeting, and home maintenance, and each comes with easy to follow lessons, videos, and printable worksheets, assignments, and projects. Each lesson is focused on teaching skills that will prepare you for real life. Don’t give points, teach your students about financial management by paying them money for their work. With a CTM Bank subscription, one instructor can access and manage their students bank accounts. The pricing is based on the number of students the teacher will be tracking, ranging from $30 for 5 students to around $410 for 200 students. Each workbook is designed to follow the lessons. With step by step instructions, students can take notes, practice, and complete all of their assignments in the workbooks. 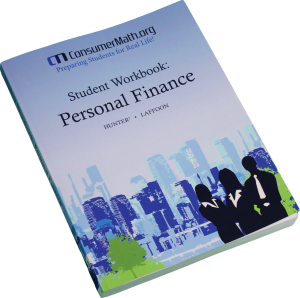 These workbooks are designed to be saved and become a valuable resource for students to use throughout their life. Show your students how to deposit checks, pay bills, and keep track of their spending as they earn money in your class, Our perfect bound Checkbooks includes 25 Check Registers, 200 individually perforated checks, full-color Check Writing Guide, and full-color Check Register Guide. For schools that won’t purchase workbooks, the resource manual is a convenient copybook for teachers to use. Each manual contains a copy of each of the workbooks and a copy of check registers and checks for you to photocopy and distribute to your larger classes. This download contains PDF copies of each of the workbooks, checkbooks, and PowerPoint versions of the presentations so you can modify them for your own classroom and teaching style. There are no video files in the download.